The New Mexico Study joins eight other state studies now reporting on a total of over 3300 schools delivering the same message: school library media centers make a difference in academic achievement. 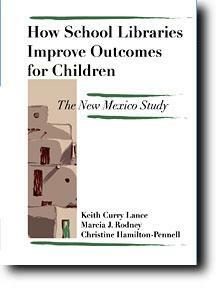 This book contains the official report of the study under the auspices of the New Mexico State Library. According to the executive summary: \New Mexico achievement test scores rise with the development of school library programs. The relationship between school library development and test scores is not explained away by other school or community conditions at the high school level... New Mexico achievement test scores tend to rise with increases in: school librarian and total staff hours per 100 students; print volumes per student; periodical subscriptions video materials and software packages per 100 students; and school library expenditures per student. The volume contains several reproducible handouts for a quick summary of the study in addition to the research report. This study is also summarized in the volume: Powering Achievement 2nd ed. by Keith Lance and David V. Loertscher found in the research section of this web site. While completed in 2002 this book is the first printed publication available for the first time in January 2003. Royalties from the sale of this publication will be donated to the New Mexico State Library Association.